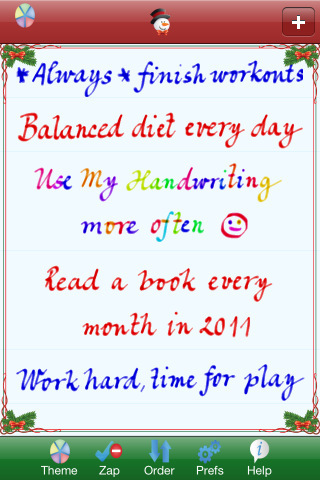 Use Your Handwriting is a free iPhone and iPad app from Gee Whiz Stuff for jotting hand written notes on your device. Many people who switch to an Apple device find that the touchscreen is one of the biggest hardest parts of learning how to use a smartphone/device, especially the popup keyboard. For the life of me, I cannot use the keyboard in portrait orientation – it makes my message look like it was typed by a monkey. Only in landscape do I prevail. These types of users will probably find Gee Whiz Stuff’s Use Your Handwriting app very useful, as it utilizes your finger as a pencil stand-in. Use Your Handwriting helpfully guides you through a tutorial of its basic functions when you first launch the app. Be sure to check out the options under Preferences first, especially if you’re left-handed. Under this menu, you can change the look of your finger-writing with five different writing styles; Sharp is my personal favorite, but you can experiment. There are six different themes provided, each symbolized with a different color or icon (the number of notes you have under each theme will be shown). You can change the title of these themes as often as you like. Tap a title or color to see all the notes under that theme, and tap the + button at the top right to add a new note. Start writing! It’ll take some getting used to, but you’ll catch on. You have an eraser, left/right arrows, and an Undo button at the top right to help you write and navigate; be sure to keep an eye on your screens, as you only get five of them to fill up (use the arrow buttons to move through them). Once you’re finished, tap Done to go back to the Notes page. On your list of Notes, you can add check marks, stars, or dim the text of selected notes using the respective buttons on the toolbar at the bottom of the screen. If you deselect all notes, you’ll get a different toolbar to work with, one which mainly deals with the administrative end of things like organizing and deleting. Use Your Handwriting is a great change of pace from the normal popup keyboard Apple users are subject to. While it is doable on the smaller screens of the iPhones and iPod Touches, it is very iPad-friendly–I would probably have an easier time “writing” with my finger on an iPad. I’m a bit disappointed that we’re only allowed five screens to write on, as I expected a more this app to be structured like the default Notes app (but I suppose our notes would be rather messy that way, since we’re basically free-writing). This makes our notes into more of a list than anything else. I’d also like the ability to add more themes, but the colors we have right now–bright neon rainbows against pitch black–are sufficient. Use Your Handwriting actually has a lot more options than I was expecting to get; for a free app, they could’ve just stopped at allowing you to write with your finger. I personally love the idea of having notes in my own curling handwriting show up on what is usually a strictly formatted device, so if you prefer things with a more personal touch, this app might delight you. AppSafari review of Use Your Handwriting was written by Julie Guan on March 23rd, 2011 and categorized under App Store, Art, Free, Fun, Notes, Productivity, Utilities. Page viewed 4854 times, 2 so far today. Need help on using these apps? Please read the Help Page.